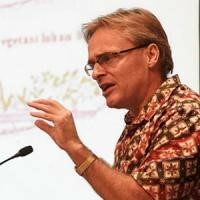 Johan focuses on green economy mainstreaming in development planning in Indonesia to address drivers of deforestation as well as work on improving the ability to address peat land fires and peat land management both through facilitating stakeholder engagement as well as providing high level policy advisory services. Before joining the UN-REDD team Johan worked as UNDP technical specialist on sustainable development and climate change in Vietnam to mainstream climate change into development planning and facilitated the development of a green growth strategy including the development and management of a national marginal abatement cost curve. Previous work experience includes advising the AusAID funded Kalimantan Forest and Carbon Project, a REDD+ pilot project and serving as CARE assistant country director for Indonesia. He managed the UNORCID Green Economy Unit which was responsible to coordinate the international technical assistance to the Government of Indonesia on Green Growth and Green Economy related matters which included mainstreaming Green Economy into the planning system, facilitating development partner coordination and providing strategic policy advise.